This is my own x240, which I bought back in January 2015. 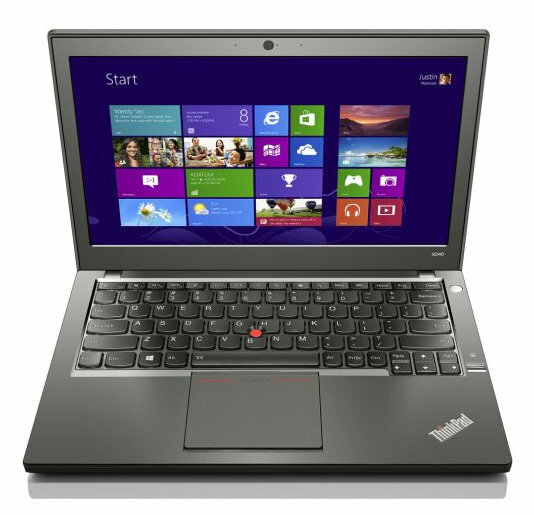 If you know about Thinkpads, you probably noticed the difference right away. 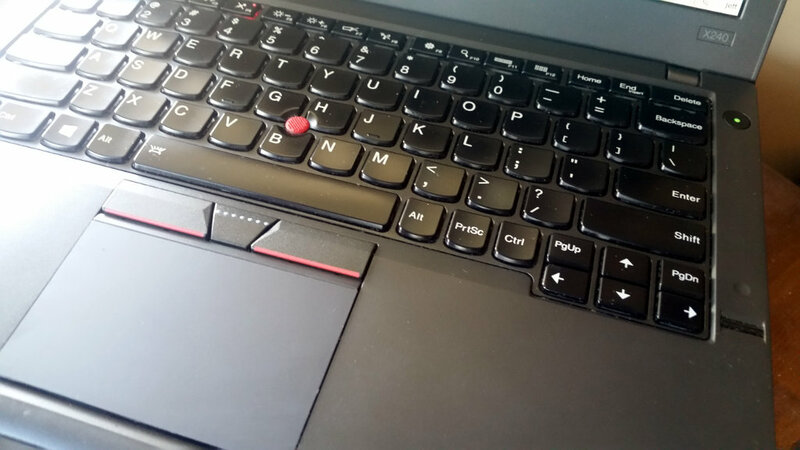 The x240 (and other models that year) suffered from an incredibly crappy buttonless touchpad. It’s so bad that it’s barely usable. Clicking is ridiculously inaccurate: there’s so much travel that the mouse pointer moves during a click, and there are no buttons to use instead. There were so many complaints that Lenovo replaced it with a better one in the next year’s lineup. This weekend I finally got around to upgrading it with a touchpad replacement part for the x250. It cost $32 on ebay. This modification is popular, so you can find info about it scattered around in forums and such. I followed the instructions on this page, How to change an x240 trackpad, as it’s one of the clearest ones out there. I couldn’t find much info about the author, whose name appears only as “Michael” on that blog. 1) Michael’s picture shows a set of wires connected to the touchpad along its side, but mine didn’t have them. 2) The touchpad sits in a well, held in place with adhesive tape, so to remove it, you just pry it off. The problem is that it’s hard to reach “under” the entire touchpad assembly, which is sort of like a sandwich with layers. I ended up partially prying off the top layer before I could get to the bottom and pry the whole thing from the case. Needless to say, this bent the touchpad. I couldn’t figure out a way to avoid effectively destroying the old touchpad. But since it was so crappy, it was also somewhat satisfying. 3) Detaching and re-attaching the small ribbon cable from/to the underside of the touchpad is VERY tricky. The end of the ribbon is held in place to the connector on the touchpad by a thin black “latch” sitting just behind it. You CANNOT just yank the ribbon out. (This took me a while to figure out!) Lift the black latch, and the ribbon will slide from the connector easily. When connecting it to the new touchpad, tuck the ribbon end securely into the connector, then flip the latch down to lock it in place. 4) At first, the new touchpad wasn’t being recognized by the machine. It worked after I re-seated the ribbon in the connector and also reset the BIOS (as shown in this video: stick a paper clip end into the tiny hole beside the battery and press for 20 seconds). I should have tried those things separately, but got a bit too excited. So you may or may not have to do a BIOS reset. So far so good. The new touchpad is definitely a big improvement. There’s much less click travel using the pad, and it feels snappier. I really like having the buttons. The only quirk is that the surface of the touchpad now sits just a hair higher than the palm rest. It’s probably slightly more likely for my hand to accidentally brush it while typing, as compared to the original touchpad, but only time will tell for sure. It feels like a totally different computer. A refine_viaf user recently commented that she would like to get Library of Congress IDs for the name candidates in OpenRefine, instead of VIAF IDs. It would be ideal if the name IDs for LC and other sources could be additional fields in the JSON data returned from refine_viaf, which you could then extract using some GREL code. Unfortunately, OpenRefine doesn’t allow you to access additional fields on name candidate objects. One quirk is that OpenRefine will create broken hyperlinks for a few sources (at the moment, these are BNC, BNF, DBC, and NUKAT). This is due to the fact that the IDs in these URLs don’t match the name record IDs, which is a requirement for the hyperlinking mechanism to work properly. In short, you can now use refine_viaf to reconcile “directly” against the name authority records of VIAF’s source institutions, which should be useful to many people. Author jeffPosted on October 28, 2013 October 28, 2013 Categories misc, python, software, work4 Comments on Goodbye, Sublime Text? This seldom-updated blog uses WordPress, which for the most part works very well for my purposes. Notice how there’s no space between “do” and “multiple dispatch” (the second link). This only happens in Chrome. In Firefox, it looks fine. It appears that using the “Open Sans” font causes Chrome to render the text inside a hyperlink with an improper amount of spacing beside it in some cases (not all). I wanted to fix this for Chrome but keep the Open Sans font in other browsers, since I like it better than the other sans serif fonts. After a bit of playing around, this is the cleanest way I came up with to accomplish this. The code looks for Chrome in the user agent header; if it finds it, it removes the “custom-font-enabled” css class from the body tag, which had been added by the stock twentytwelve theme. Note the priority level; the default is 10, so we set our priority to 20 to ensure this filter runs after the one in the base theme. Using a child theme avoids making changes to the twentytwelve theme, which is desirable, since any updates would overwrite your changes. You should be able to update twentytwelve and the above child theme should still work.